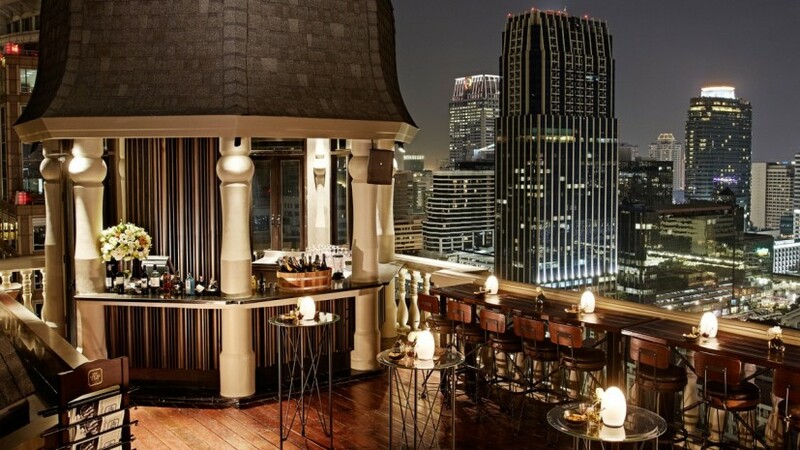 The Speakeasy at Hotel Muse Bangkok is home to one of the best rooftop restaurants in Bangkok. At this fabulous rooftop restaurant in Bangkok, diners can enjoy unforgettable evenings with gourmet cuisine and amazing views of the city 25 floors below. The Speakeasy rooftop restaurant in Bangkok is located on the 24th and 25th floors of Hotel Muse Bangkok. Inspired by the 1920s prohibition bars in America, this popular rooftop restaurant in Bangkok encompasses The Lawn, Long Bar, Terrace Bar, The Blind Pig cigar lounge, and three luxurious private rooms. Each distinctive venue looks out across a glittering cityscape. The menu at this rooftop restaurant in Bangkok focuses on local and western gourmet dishes, served for sharing with friends. Signature dishes at the rooftop restaurant in Bangkok include The Speakeasy lobster club sandwich, a distinctly modern interpretation of a classic made with rock lobster, avocado, grilled capsicum, smoky bacon, wild rocket and a homemade dressing. There’s also 150-day grain fed Australian rib eye steak served with sun dried tomato, rocket and cheddar cheese, all in freshly toasted ciabatta, and Cubano, 12-hour marinated and slow roasted pork tenderloin with Swiss cheese, mustard and pickles. Another traditional dish given new life at The Speakeasy is chicken Cordon Bleu with smoked scamorza cheese and speck ham served with guacamole, all enlivened by a barbecue or spicy Thai sauce. Guests can also enjoy Champagne and cocktail promotions, as well as the sommelier’s cellar selection of New and Old World wines, as they experience one of the best rooftop restaurants in Bangkok. You can also make your own gin and tonic from a list of 24 exceptional gins including the complex Monkey 47 made in the Black Forest with 47 botanicals to produce its characteristic woody, citrus and grassy notes, Diplôme, a unique French gin distilled in Dijon, Ink Gin, an Australian floral infused craft gin, pot distilled in small batches using organic botanicals and naturally infused with butterfly pea petals, and many more. Complementing the exquisitely crafted boutique Hotel Muse Bangkok, The Speakeasy deserves of its reputation as one of the best rooftop restaurants in Bangkok with an amazing view. Discover The Speakeasy rooftop restaurant in Bangkok.